At many universities and other institutions, heartfelt campaigns are underway to divest from fossil fuel companies as a way to address climate change. Is it possible to support urgent action on climate change without opposing fossil fuel use? Indeed it is and there are sound arguments for why those concerned about the planet need not support fossil fuel divestment. One such argument is scientific, and so offers reasoning more fundamental than the financial arguments or moral pressure heard in much of the discussion around fossil fuel divestment. In fact, climate science itself implies that the real need is to focus on rebalancing the global carbon cycle. Rising CO2 concentrations are clearly disrupting the climate and there’s no doubt that fossil fuel use is the main cause of excess CO2 emissions. But it’s not fossil fuels by themselves that are the culprits; rather, it’s how we use them. 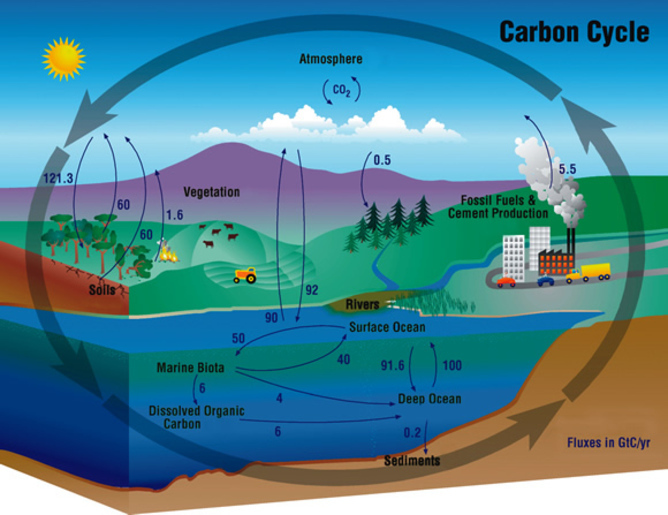 One of the foundations of climate science is the global carbon cycle, the largest part of which is the uptake of CO2 through photosynthesis and the subsequent release of CO2 when the carbon in organic matter is consumed, or metabolized, to produce food for plants. Chemically speaking, carbon is the fuel of life. Over eons, a slow accumulation of unmetabolized carbon accumulated and became the coal, oil and natural gas resources we consume today. Burning fossil fuels spews CO2 into the air faster than photosynthesis and other processes can scrub it back out. The harm is caused by the imbalance in the carbon cycle rather than the carbon itself. Each year, roughly 200 petagrams, or 200 billion metric tons, of carbon circulate between the atmosphere and the land and sea per year. If it weren’t for human activity, slightly more CO2 would by removed from the atmosphere than is released by plants, animals, microbes, other organisms and natural processes. As the CO2 is removed from the air, carbon would be slowly accumulating in forests and other forms of vegetation as well as soils and sediments. Excess release of CO2 throws the cycle out of balance. Unmitigated combustion of fossil fuels releases about 10 billion metric tons of carbon per year. Deforestation and other conversions of natural lands release roughly one billion metric tons per year. Progress was made in reducing deforestation for a number of years, but unfortunately it has started rising again. Globally, fossil fuel emissions continue to rise. US fossil CO2 emissions have declined a bit since 2007, largely because of the recession but also due to efficiency gains and shifting some power generation away from coal to natural gas. The point is that CO2 is always cycling into and out of the atmosphere. Fossil carbon combustion amounts to just five percent of the 200 billion tons per year of total carbon circulation, but the resulting imbalance adds enough CO2 to the air to destabilize the climate. Reducing the use of coal, oil and natural gas is clearly important, but it’s not the only way to bring the carbon cycle into better balance. One option is to capture the carbon in fuel either before or after combustion and then sequester it underground. Called carbon capture and sequestration (CCS), this approach can be used in power plants and other large stationary sources of CO2 emissions. Another option is to speed up the rate at which CO2 is removed from the atmosphere and then sequester the resulting carbon, thereby balancing out the CO2 from fuel combustion. These carbon dioxide removal (CDR) mechanisms, sometimes called negative emissions, include: reforestation; advancing agricultural practices that increase soil carbon; rebuilding wetlands, grasslands, peat bogs and other carbon-rich ecosystems; and restoring degraded lands. No tilling is a farming practice that keeps more carbon in the soil, rather than sending it into the atmosphere. 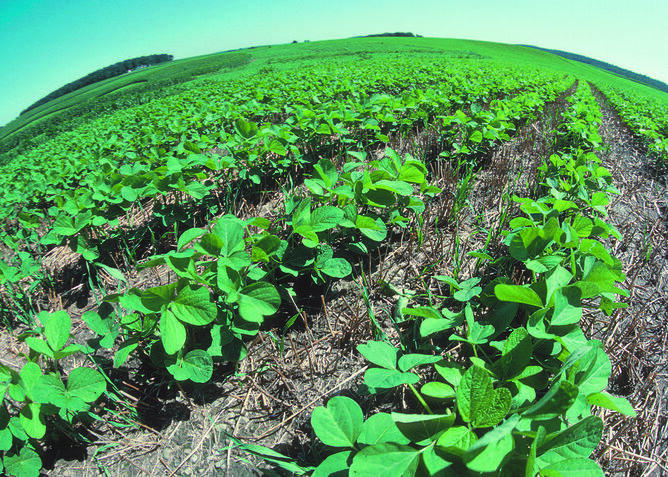 Here soybeans grow next to residue from wheat crop, which reduces erosion and maintains moisture for the new crop. Tim McCabe/USDA Natural Resources Conservation Service. Known as ways to recarbonize the biosphere, such strategies are every bit as critical as efforts to decarbonize the energy system. Collectively they could remove three to four billion metric tons per year from the atmosphere and thereby offset as much as a third of fossil fuel emissions. Researchers debate the economics of CCS and CDR compared to reducing fossil fuel use. Cutting fossil fuel consumption can be accomplished by moderating population growth, shifting away from energy-intensive activities, improving energy efficiency and using non-carbon resources such as solar, wind and nuclear. However, not every shift from fossil to renewable fuel is helpful. Substituting biofuels for petroleum now robs the biosphere of carbon-rich resources, such as corn or sugar cane, that otherwise would be used for food and feed. 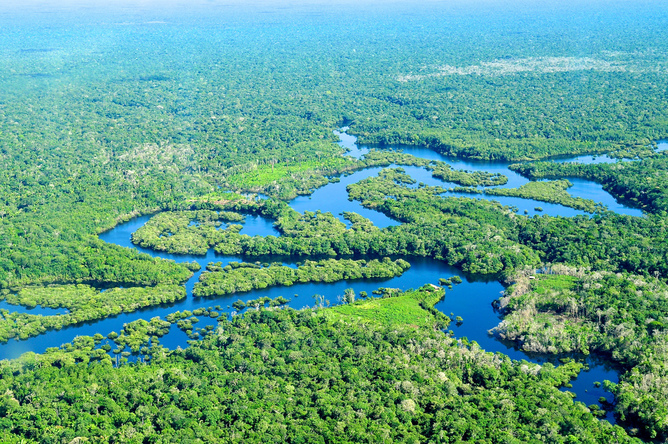 Land used for biofuels can also lead to additional deforestation. Although some fossil carbon remains in the ground when biofuels displace petroleum-based fuels, the net effect of biofuels is to throw the carbon cycle further out of balance. This situation shows how a simplistic analysis of “fossil bad” and “renewable good” is misleading. Even if one decries the policies and practices of certain corporations, that doesn’t mean their core business should be eliminated. There is rightful anger at some parts of the fossil fuel industry for sponsoring anti-environmental campaigns. But it’s not helpful if such frustration causes a confusion of ends and means. Getting rid of fossil fuels is not the end goal. The end goal is balancing the carbon cycle. That’s what must be urgently pursued through whatever means are at hand, including those that enable prudent use of coal, oil and natural gas while actively mitigating their impact. In short, restoring the Earth to balance is the proper focus of environmental policy and advocacy.